The cabinets look wonderful! I love them -- such an awesome built-in apartment feature you scored, girl. As for painting the insides, DO IT. 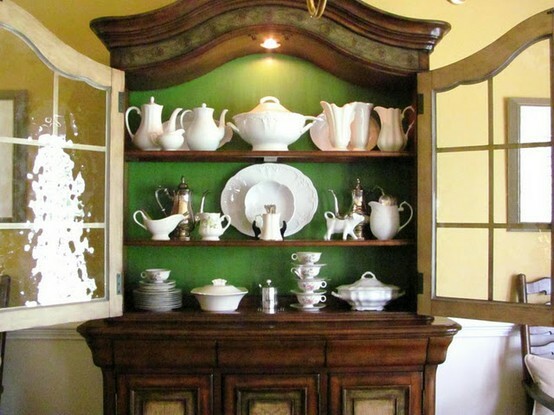 In fact, I've been wanting to do the exact same thing to my cabinet, too! For the exact same reason. So let's make this a lil' 75th and Sedgwick project, shall we? In terms of yours, I love the coral idea AND the paper (I want to frame that paper). Hmm, you've got such great stuff though, I wonder if a solid color will allow it all to shine a bit more? I think the coral will be great because you've used it in some areas of your kitchen but not every wall. 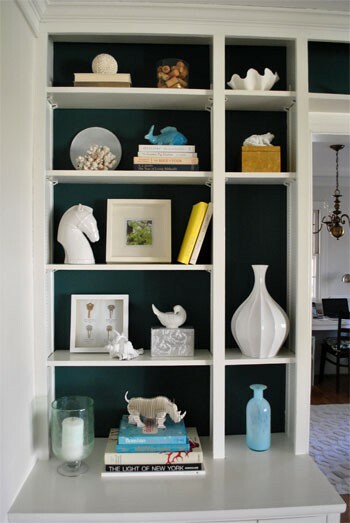 I'm thinking navy for mine (psst: see pics of my cabinet here and here). Thoughts? 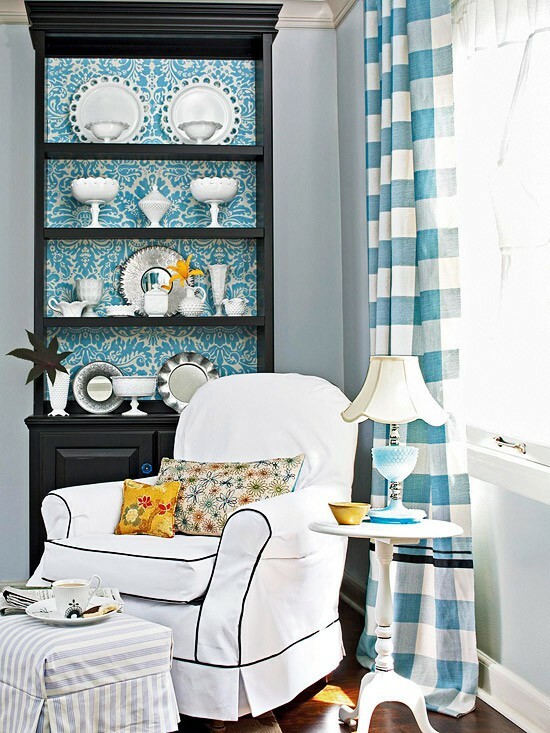 The room where its located now has a few navy accents, but is otherwise pretty neutral. 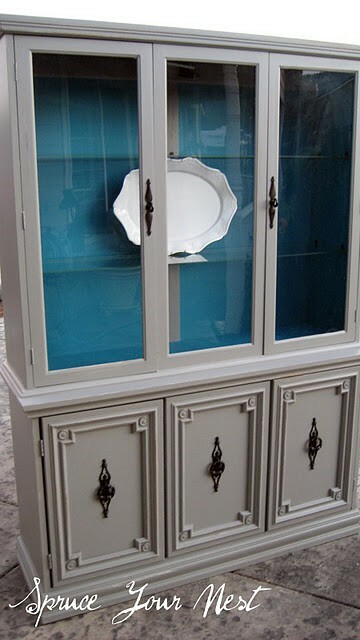 Since this cabinet is traveling with me when I leave, I'm thinking that it's gotta be a color that will work well with lots of spaces. Navy is a good choice, right? Its so classic, its almost a neutral. Also, I think it will contrast nicely with my gold trimmed china. Then again, this pattern looks great! Love the green. We gotta go saturated. I think these shelves are glass, but I bet I could achieve the same all-over color look by painting not just the back but the entire board. What do you plan on doing? 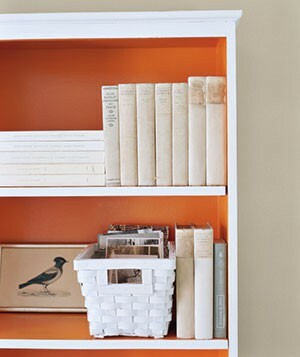 Some orange inspiration for you! Yours will be a bit pinker, though, right? Some inspiration for me. I love this greener version above, but I think I'm gonna go straight navy. So, D, meet back here in a few weeks to show off our work? 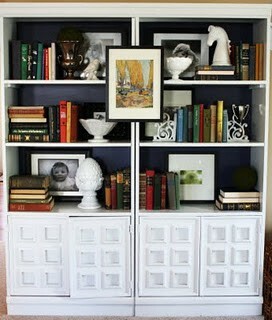 Lovely inspiration - we have built-in china cabinets in our apartment, but they're temp bookshelves right now. And wine glass holders. And the doors don't close, because they're 90 years old have have had way too many coats of paint on them, haha. But I'd love to do something prettier with them eventually! Anni, I totally hear you. Our cabinets are SO hard to open because of the many layers of paint. And they stick during the summer heat. Oye!